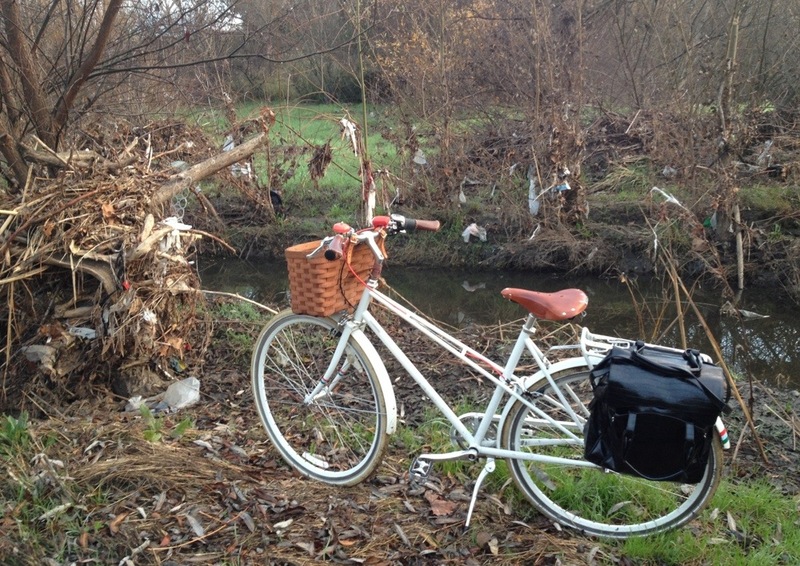 Bike Commute Diaries: Keep America Beautiful | One woman. Many bicycles. Not being cocooned in car whizzing past the world has changed my perspective. I smell the acrid exhaust and hear the deafening noise of vehicles. I see the unnatural froth in the river after storms and see the plastic caught in its trees when it drains. I didn’t start biking to save the planet, but it’s opened my eyes, ears and nose. I hear you. We were on a very nice white sand beach in southeastern Mexico last year and every handful of sand I picked up had plastic fragments identifiable with the naked eye. Everywhere we go there seems to be plastic bags blowing around, even on a volcano in Peru. Definitely need to reduce the use of plastic and make a better effort of keeping it contained. That’s sad that it was mixed in the sand. In Malaysia there were people hired to rake the beach and remove the big items. Flip flops were particularly common. But I think mainland China was the worst I’ve seen for roadside garbage. Big piles everywhere. You know it’s bad when you notice it from a fast moving bus. San Jose has a plastic bag ban but you’d never know if from the river. Part of the problem is that the river drains the whole valley, not just San Jose, and lots of the plastic comes from things other than bags. And of course, the resident homeless camped on the river don’t have curbside garbage pick up. Hey – is this taken on the Guad or the Coyote? It might be in Watson Park, but I can’t tell for sure. My bike’s on the west bank of the Guadalupe River Trail, just north of Coleman. Further downstream between Hwy 880 and Skyport is much worse, but you can’t get down close for a photo from the west bank. There’s a closed trail on the east bank that would have gotten me closer, but that’s where the homeless live in tents along the east bank. The tents are a lot more visible now that the leaves are off the trees. It’s true that being out in the open on your bike really can change your perspective. I’m noticing something new every day and I take they same bike route to work each day. A new smell or sound or color I hadn’t noticed before. I’m curious what type of pannier you’re using on your bike in this picture? I like it. Being a Dutch company, FastRider has a great selection of bike bags for all occasions. They can be hard to find outside of the Netherlands, which is why I had to buy online. Ahh that’s awesome, I like all the photos of it in the other post, looks like it can really fit a lot, and it’s quite stylish! I’m going to have to look for something like that for my bike. Thanks for the help! The accumulated trash on the banks of the Guadalupe reminds me of the 1971 crying Indian ad. Me too. So much I almost put a link to it in the story. The actor is from SW Louisiana. He’s the son of Italian immigrants but he played Indian roles his whole career under the name Iron Eyes Cody. His wife and adopted children were Indian though, so he had some connection to native people.